Representatives from FM Brush Company and Dynasty Brush often attend trade shows and conferences around the world. These events allow us to meet artists and educators, connect with distributors, and learn more about the fine folks who use and sell our products. In January we traveled to Phoenix, Arizona for Creativation 2017, a trade show organized by the Association For Creative Industries. Artists, crafters, retailers, educators, and art/craft industry giants all come together at this yearly event. Shortly thereafter the FM Brush/Dynasty teams traveled to Frankfurt, Germany for Creativeworld 2017. This show brought together FM Brush employees from our New York headquarters and our Thailand location. Traveling to Frankfurt from New York was President and CEO Jeffrey Mink, Vice President of Sales, Gregory Mink, and Director of Operations Michael Mink. Coming in from our Thailand office was Managing Director of FM Brush Thailand Napat Wongsai, and Sales staff members Ratchakorn Changpradit and Sirinat Phongthong. Guests from over 25 different countries stopped by our booth on the trade show floor to learn more about our products. And speaking of products, we have new brushes to share with you! 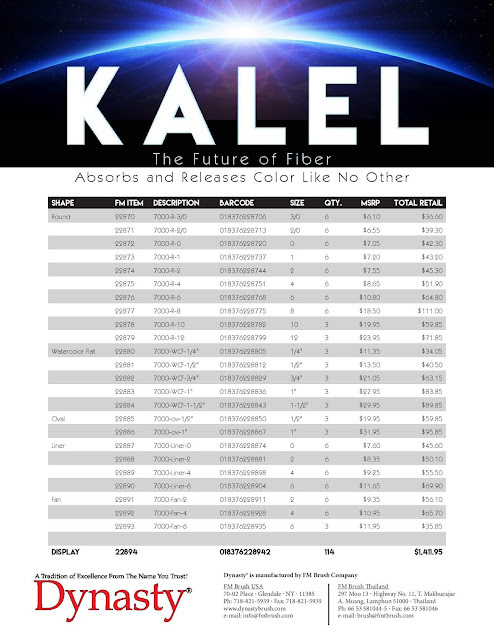 Kalel: With more than four years of research and development, Kalel is the world's most advanced synthetic fiber. Kalel's super synthetic fill material shares many properties of found in animal hair bristles. Faux Squirrel--Long Handle: One of our best-selling brush lines has been expanded. Our customers have been asking for a longer handled Faux Squirrel for a long time. These new, long-handled models will help make easel painting much more comfortable. New York Sable: For nearly 90 years, FM Brush has been hand-crafting fine artist brushes in New York. To honor the home of this craftsmanship and artistic excellence, we have named our newest line of natural hair brushes after our own New York. These pure red sable brushes are long-handled for table ease in painting at your easel. 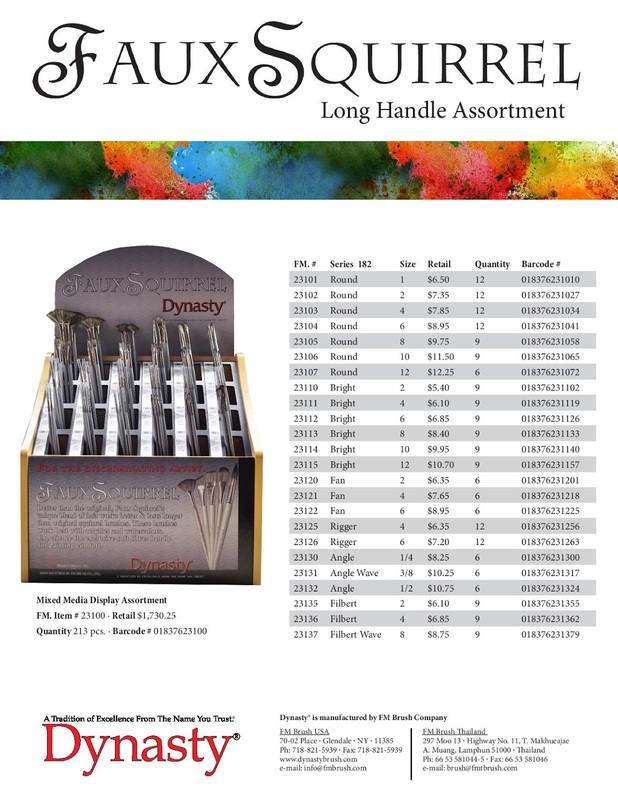 And as always, if you would like more information our our brushes, please go to the Dynasty website! In our last blog post we talked about inspiration, but in this entry we are exploring space--as in the space where you create. The environment in which you set up to do your work has a serious impact on your ability to get things done. So let's explore your what is in your work space! Our Social Media Coordinator Lori shares a work in progress in her guest room studio. What do you call the place where you paint? Is it the studio? Your workshop? The Room Where It Happens? I simply call my space my office. Is your painting space? Do you paint at home in the basement? Have a workshop in the garage or shed in your yard? Do you rent a studio space in a warehouse downtown? Do you do all of your painting at a community center or a collaborative shared space? My "office" is in a the guest bedroom on the second floor of my Pittsburgh home. How do you set up your space to enhance your productivity? What do you keep around you to help you create? Do you like a sparse environment or one that is full of lots of things you love? I have a big bookcase full of art books and supplies as well as fun knickknacks that I love. I hang lots of inspirational things on the walls: poems, posters, lots of art made by my kids, artwork given to me by friends. Besides an easel, I also have a desk and rolling chair. And since it is a guest room, I also have a bed in there which is where you are likely to find one of my kids or one of my cats hanging out if I am trying to get work done. They like to keep me company! What's is the lighting like in your studio? Do you listen to podcasts? Light candles? Watch movies while you work? Paint to the sound of your own thoughts? My office has three windows and has the best natural light in the house which is why I love that space so much. I usually have to listen to something while I work. Sometimes it is music, sometimes it is NPR or a podcast. It really depends on my mood. But I definitely don't work in silence--I need some background noise. Do you work at an easel? Standing up? Sitting down? At a desk? A drafting table? Do you pin your work up to the wall? Early bird? Night Owl? For large pieces, I prefer standing at an easel. For smaller work, I sit at my desk. And I definitely work best in the morning or afternoon. As soon as the light is gone, I'm done. I am not nearly as productive when it is dark outside. I would LOVE hear all about where you paint and how your studios are set up! Please tell me all about it in the comments or over on our Facebook page. 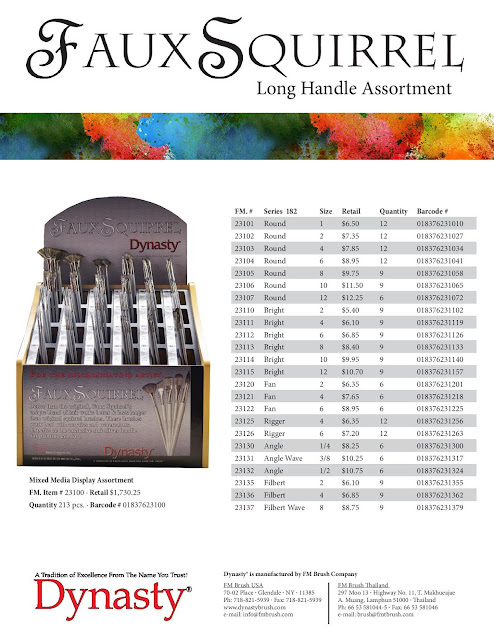 And as always, for more brush information, check out the Dynasty Brush website.